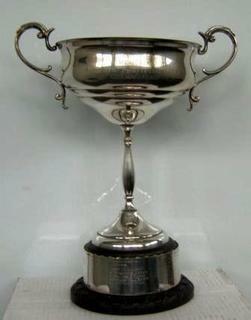 This page has been changed to show both trophies and major tournament winners. Have a read of the delighful Diamond Jubilee 1931-1991, a short history of the Club written by member Marie Rice. Do you know where these are now? 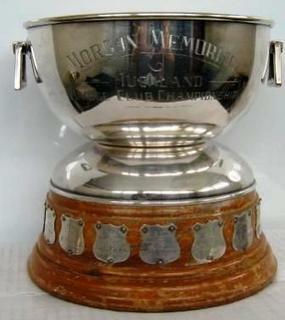 Adams Cup, Akarana Cup, Helen Blythe Salver, Richards Cup. 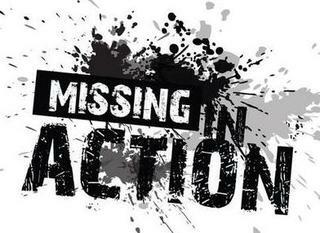 Please contact Janet Barnard. 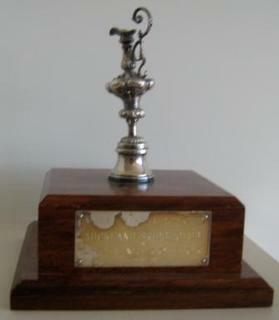 This trophy was donated in 1999 to commemorate The Americas Cup. Competed for in the Waitangi day Tournament. 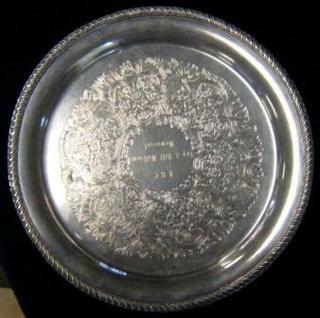 Bruce Bell Salver donated in 1974 and awarded to the top mens pair at the Bell Taylor Pairs played early each year. Donated in 1974 for an open tournament in February, the Bell Taylor Pairs. 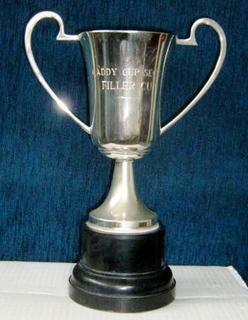 It is awarded to the top womens pair. Played for at the Easter Congress Intermediate/Junior Pairs 5B Tournament. 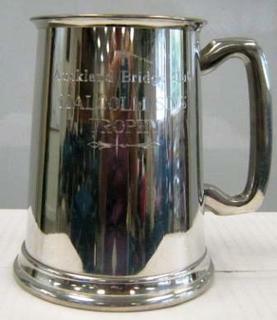 Ailsa Hollis joined the Auckland Bridge Club in the late 1940's. She was an outstanding player and a very popular teacher. She was also a chess representative for New Zealand in Australia and at the Israeli Olympiad. Her last game at the ABC was in 1996, and she came first. Donated 1975. Open Tournament played around on Anzac Day. 10A Congress Pairs held in Queen's Birthday weekend. 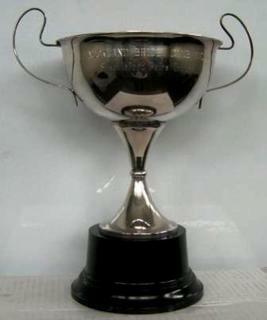 Trophy donated 1961. 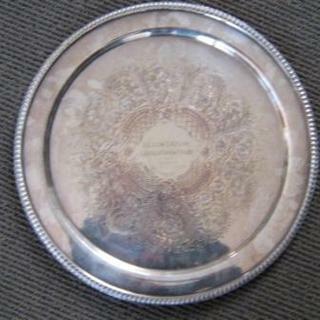 This salver is awarded to the top Junior Team or Pair at the Queen's Birthday Congress. 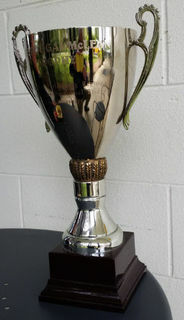 It was presented by Robert Leitl in memory of his wife who played on Wednesday nights. Tournament. 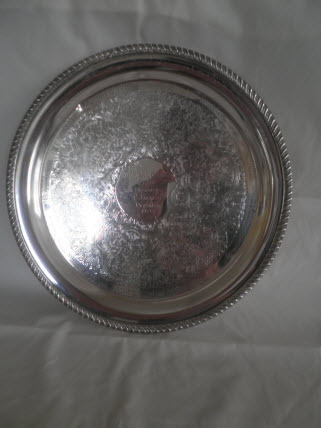 Donated 2003, Congress Played at Queens Birthday weekend Top Intermediate team. 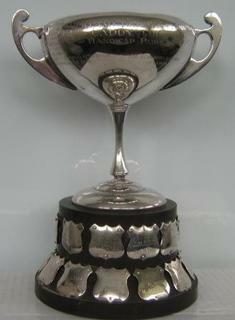 A 3A pairs tournament held on a Saturday in August at the same time as the Intermediate 5B Tudor Biggs Rose Bowl. 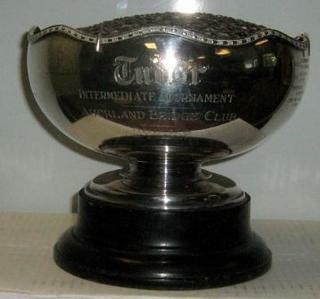 Tudor Biggs Rose Bowl 5B for Intermediates donated in 2003. Played in conjunction with the Billie Tohill tournament, usually in August. 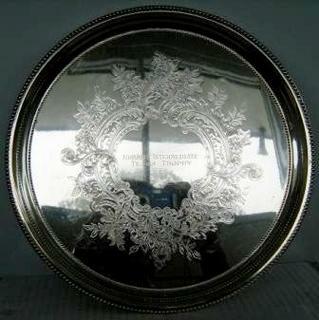 Awarded to the winning Junior Pair at the Tudor Rosebowl Tournament played in August. 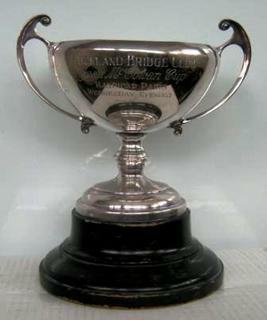 Trophy donated in 1995 by Bruce Porter for Ladies bridge. A Thursday competition usually played in June. Lesley was a Wednesday and Friday daytime player. A feisty woman, with great integrity. The best individual score over six Thursday Tournaments. 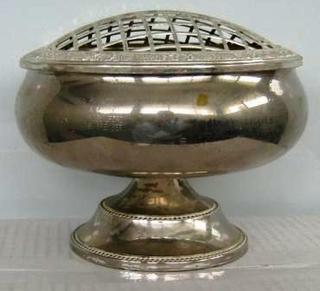 Trophy donated 1937. Thursday PM. 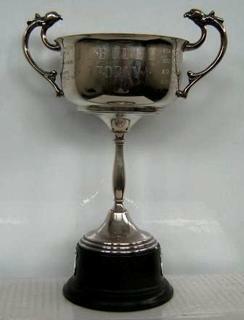 New cup dated 1991 Championship Pairs (Honours' Board). 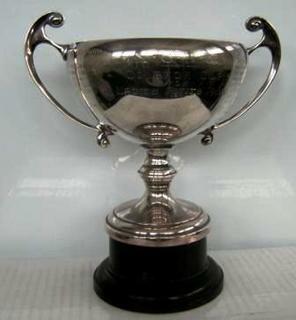 Also known as Warren and Williams Cup. Usually played in March. Wednesday PM. 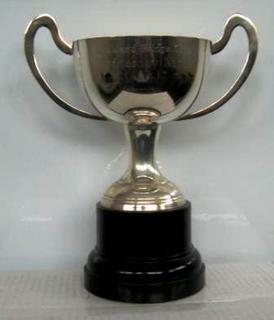 Trophy donated in 1994 by Pauline Weatherby, a former Club Secretary. Currently played in April. Monday AM. 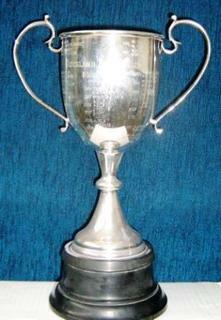 Donated 1990 by Neal Topia, President 1988-89, three session tournament usually played in May. Monday AM. 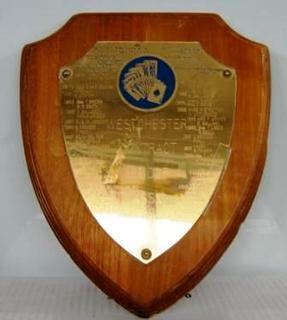 Donated 1982 Championship Pairs (Honours Board). Usually played during July. Friday AM donated in 1997. Section 1 Championship. Usually competed in April - May. Thursday PM. 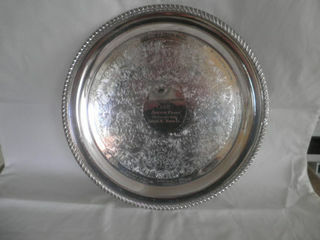 Donated 1991 H W Shackleford was president in 1951/53 and was made Life Member in 1947. Event usually played in July. Donated in 2008 by Helen's family, a 3 or 4 session tournament on Friday afternoon. Helen was a popular member and player on Wednesday and Friday am sessions. Currently played July - August. Friday PM. Championship pairs, Honours Board. Current competition is in September. Nora Heighway married AE (Ted) Heighway, came to NZ from France and lived in Arney Cres, Remuera. She loved her bridge and when not at bridge created beautiful tapestries. Wednesday AM. 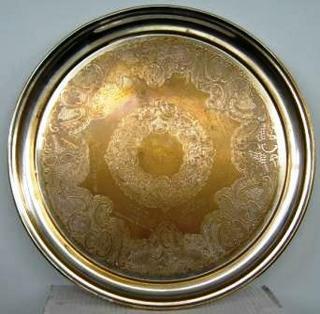 Donated 1948. Championship pairs section 1 (Honours Board). The young club was in financial difficulties, Mr Polly Morgan took over as secretary. Currently played October - November. 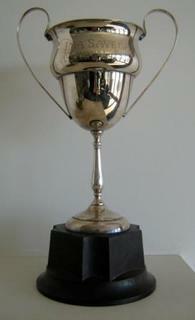 Friday AM, a six session tournament usually held in September, awarded to top pair in Section 2. 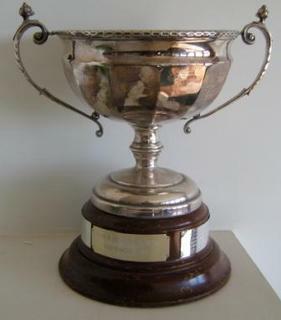 Donated in 2008 by Roma Sims, a long term member of the Club, in commemoration of her son Malcolm who was an talented player, all round sportsman and character who passed away at the age of 50. A five session open tournament for Thursday PM - Currently played in August. This is a Swiss pairs 6 session tournament in section 1 Tuesday PM. 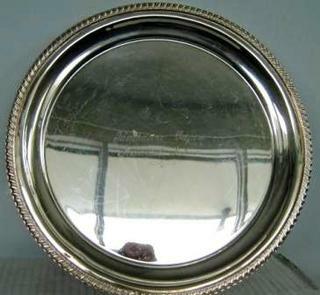 Miss Caddy was one of the early members of the club and served as almoner for many years. Currently paid in November. President's Pairs Section 2. Tuesday PM. 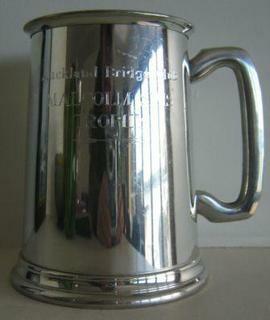 Ruth presented the Filler Cup to the club in honour of her husband Sol, a lover of life, family, bridge and sports. Wednesday PM donated 1980. 5/6 session tournament held in November. Friday AM. 3 session tournament, Spring pairs section 1. 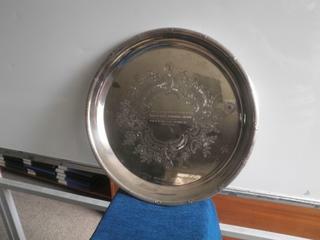 This salver was presented to the club in 2000 by Mr Pillai of Hydrabad, he played at our Club for several months and enjoyed his time with us. 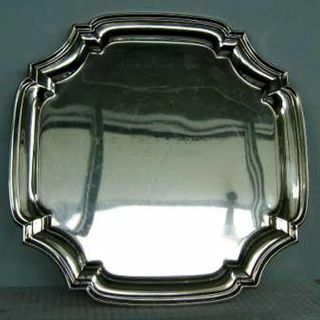 He donated the salver on behalf of the Indian Bridge Federation to promote good will between the countries. Friday PM. Championship Teams. 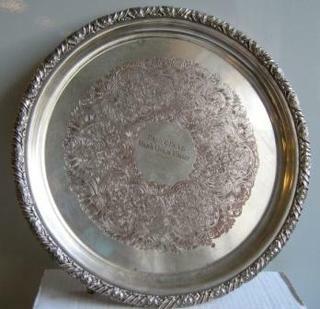 Donated in 1991 by Mrs Janet Barnard to encourage teams events at the Club. Janet was Club President 1990-91 and elected a Life Member in 2001, and enjoys her bridge! Current competition is in November. Thursday PM. Donated 1940, five session open tournament usually played November/December. 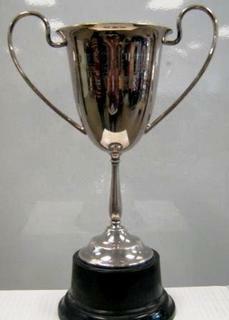 Individual Points Trophy for Monday AM. 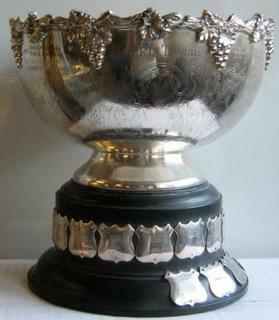 Trophy donated in 1981. 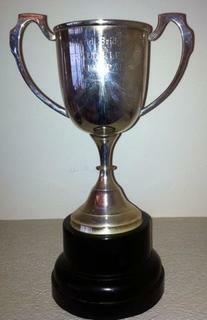 Ladies points trophy for Tuesday PM. 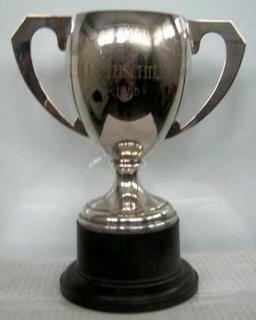 Trophy donated in 1960. 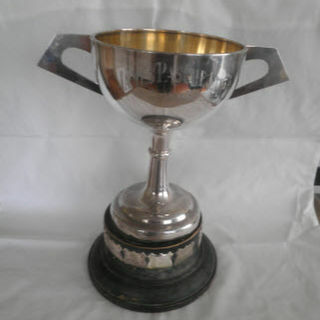 Individual Men's points trophy for Tuesday PM, Section 1. 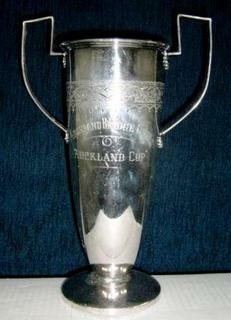 The Trophy was donated in 1955. Eric Rothschild left Germany to arrive in New Zealand in 1939. He lived in Symonds St Auckland where he had a fancy goods shop opposite Khyber Pass. An excellent bridge player and uncle of Ruth Filler (see Filler Cup.) He passed away in l956. 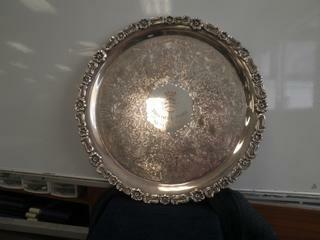 Individual points trophy for Wednesday AM. 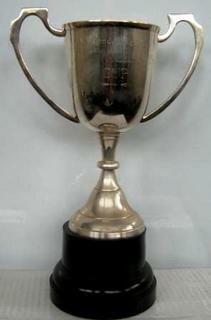 Open Points Trophy donated in 1964. 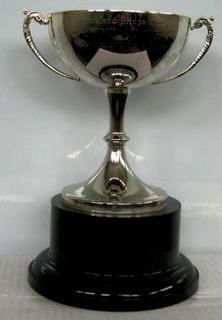 Individual points trophy for Wednesday PM. FJ Jalfon was president in 1974/75 and was made a Life Member in 1971. 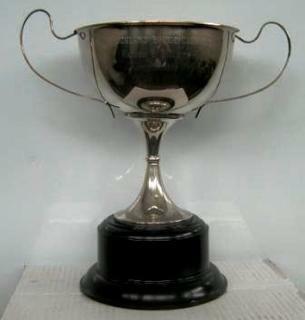 Ladies Points Trophy for Thursday PM. Nora Heighway married AE (Ted) Heighway, came to NZ from France and lived in Arney Cres, Remuera. She loved her bridge and when not at bridge created beautiful tapestries. 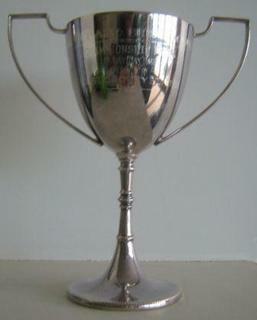 Men's Points trophy for Thursday PM. Donated 1967. 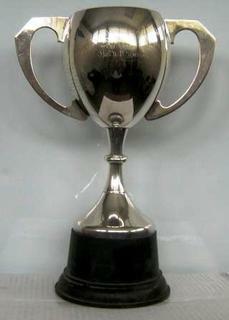 Individual Points Trophy for Friday AM, Section 2. Albert was an avid Bridge player and was a competitive player at the age of 100! 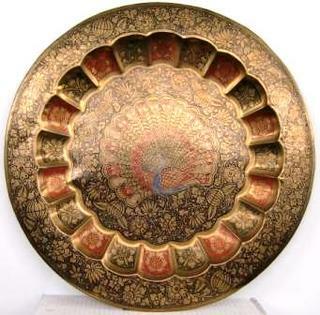 Donated 1993 by his son Gordon. 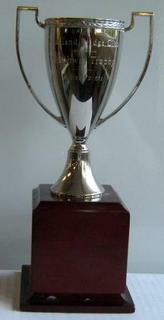 Individual Points Trophy for Friday AM, Section 1. Donated 1986. 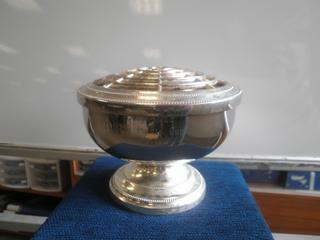 Individual Points trophy for Friday PM. 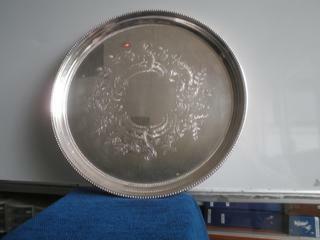 A novice trophy played for on Thursday AM. Miss Coutts was a very popular director and managed to keep the room quiet with a small bell and a quiet voice. She was made a Life Member in 1946. A three session novices tournament on Monday PM. 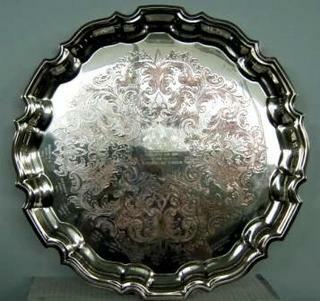 This salver was donated in 1995. Elsie Hubber played at the club in the 1950's when it was at Airdale Street. She taught bridge and was a benefactor of the club. A three session tournament for novices on Monday PM. 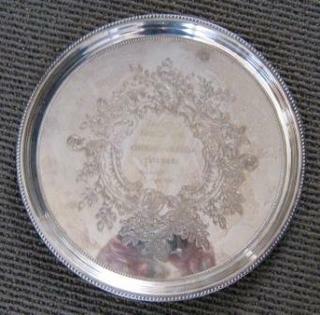 This salver was donated by Robert Leitl in memory of his wife who played on Wednesday night.